Calendar shortcuts and important formulas for all competitive exam. 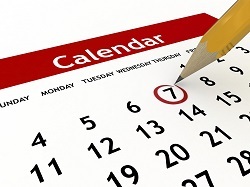 CALENDAR : calendar is used to find many problems related to odd days, leap year, and counting of odd days and many. 1. Odd Days: We are supposed to find the day of the week on a given date. For this, we use the concept of 'odd days'. (a). Every year divisible by 4 is a leap year, if it is not a century. (b). Every 4th century is a leap year and no other century is a leap year. (a) Each of the years 1948, 2004, 1676 etc. is a leap year. (b) Each of the years 400, 800, 1200, 1600, 2000 etc. is a leap year. (c) None of the years 2001, 2002, 2003, 2005, 1800, 2100 is a leap year. 1. 1 ordinary year = 365 days = (52 weeks + 1 day.) 1 ordinary year has 1 odd day. 2. 1 leap year = 366 days = (52 weeks + 2 days) 1 leap year has 2 odd days. = (17 weeks + days) = 5 odd days. Question-1: It was Sunday on Jan 1, 2006. What was the day of the week Jan 1, 2010? Solution: On 31st December, 2005 it was Saturday. Question-2: What was the day of the week on 28th May, 2006? Total number of odd days = (0 + 0 + 6 + 1) = 7 0 odd day. Given day is Sunday. Question-3 : On what dates of April, 2001 did Wednesday fall? Solution : We shall find the day on 1st April, 2001. On 1st April, 2001 it was Sunday. In April, 2001 Wednesday falls on 4th, 11th, 18th and 25th. Solution : Each day of the week is repeated after 7 days. What was the day on 26 Jan 1948? Number of odd days in 1600 years = 0. Hence, the required day is Monday. What was the day on 6th Feb 1994? ⇒ (23 × 2 + 70 × 1) ⇒ (46 + 70) = 116 days. ⇒ 116 days = (16 Weeks + 4 days) = 4 odd days. ∴ 1993 years have = (0 + 1 + 4) = 5 odd days. ∴ Total numbers of odd days = (5 + 2) = 7. Hence, the required day is Sunday. What was the day 21st August 1992? 31 + 29 + 31 + 30 + 31 + 30 + 31 + 21 = 234 days. ∴ Total odd days in numbers = (3 + 2) = 5. So the day is Friday. What day was it on 1st Jan 2004? Numbers of odd days in 3 ordinary years = 3. Total odd day in year 2003 = (0 + 3) = 3. 1 = 1 odd day . Hence, the required day is Thursday. What day was it on 2nd may 2010? Numbers of odd days 9 years = (2 leap years + 7 ordinary years) = (2 × 2 + 7 × 1) = 11 odd days = 4 odd days. ∴ Total number of days = (3 + 4) = 7. What was the day on 8th March 1995? Numbers of odd days in 1600 years = 0. Numbers of odd days in 300 years = (5 × 3) = 15 = 1. 1994 years have = (0 + 5 + 1) = 6 odd days. Hence, the required day is Wednesday. What was the day on 13th April 1999? 98 years = (24 leap year + 74 ordinary years) ⇒ (24 × 2 + 74 × 1) = (48 + 74) = 122 days. ∴ 1998 years have = (0 + 1 + 3) = 4 odd days. ∴ Total number of odd days = (5 + 4) = 9 = 2. Hence, the required day is Tuesday. What was the day on 14th Feb 2010? Number of odd days in 2000 = 0. 31 + 14 = 45 days ⇒ (6 weeks + 3 days) = 3 odd days. ∴ Total numbers of odd days = (0 + 4 + 3) = 7 odd days. It means the required day is Sunday. What was the day on 5th may 2003? It means the required day is Monday. The same calendar year will be the next year to the one in which we get the counting of odd days as 0 (In the multiple of 7). Hence, the next same calendar year will be 2019. 1336 is a leap year, because it's completely divided by 4. So, after 35 days it will be Sunday. The 39th day, hence, will be 35 + 4 = Thursday. On what dates of April 2005 did Tuesday fall? Hence, Tuesday lies on 5th of April, 2005.